Meets all over the calendar to make up for the bad weather. Weather forces major changes to schedule in Mississippi. Just a look at what has been going on so far in the MHSAA Regions and MAIS Districts. A look at the top girl performances from the MHSAA Regionals and the MAIS District Meets. These meets have contacted me today about changing dates. It will show up later on the calendar. Check out the results as they are posted. We try to keep you up on all the meets around the State. Spring weather in Mississippi is wreaking havoc on Regional Qualifiers. Take a look at the top 100 MAIS girls going into District and the State Meet. A look at the top 100 MAIS boys as we head toward District and the State Meets. A look at the top 100 girls in the MHSAA after most of the District meets have been posted. The top ten girls in the state by event with links to the rest of the rankings at the bottom of each event. A look at the top ten boys in all events with links to the rest of each event rankings. High Alert these results are missing in action from Mississippi MileSplit. A look at the MHSAA girls that have competed in the Divisions meets so far. I hope to have an even better report tomorrow. This shows that boys that have participated in Division meets so far. 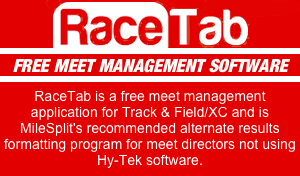 The meets listed did not have results as of 7:22 a.m. on 4/10/2019. MileSplit on the Road Again today, tomorrow and Friday.